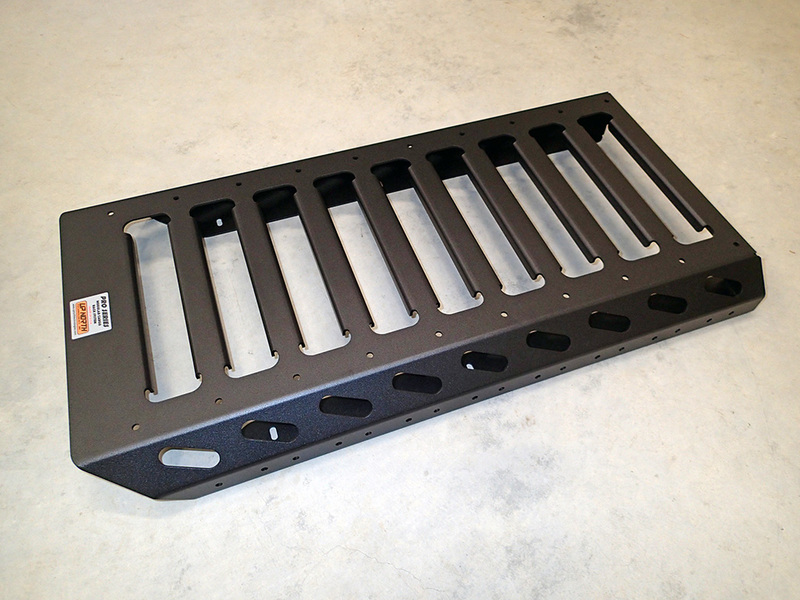 From Up North Technologies, "Fabricated from a single sheet of 1/8” aluminum plate, the PRO SERIES racks utilize a unique design and state-of-the-art CNC metal processing to achieve light weight, high strength, and a superb new look. The modular design provides for the addition of accessory components, allowing the rack to be customized for a particular application." 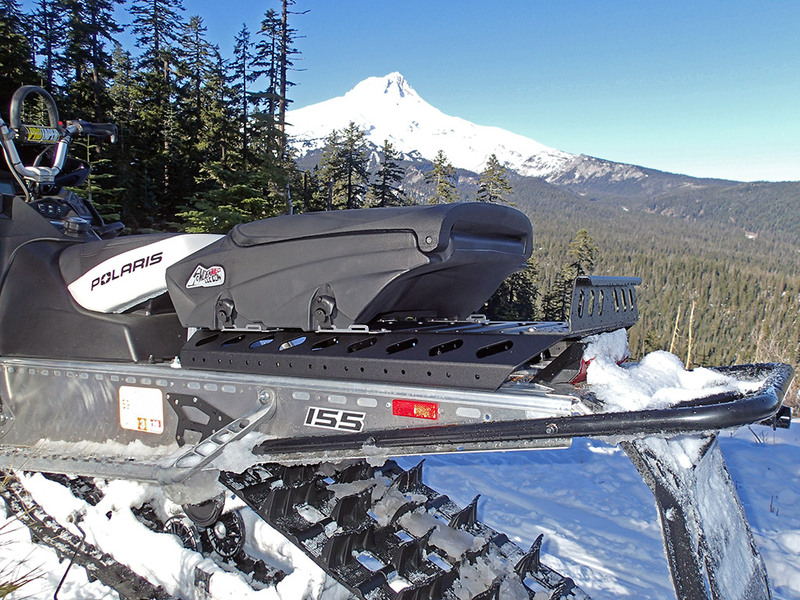 The PRO SERIES snowmobile cargo racks feature an elevated deck to eliminate heat damage to cargo and accessory bags over the tunnel heat exchangers. The over-the-taillight design of the XL models maximize cargo capacity and protect the taillight. The PRO SERIES Modular Cargo Rack features many angled slots and pre-drilled holes for attaching accessories and cargo. The custom fit PRO SERIES snowmobile cargo racks by Up North Technologies are available for many Arctic Cat, Polaris, Ski-Doo, and Yamaha snowmobiles. 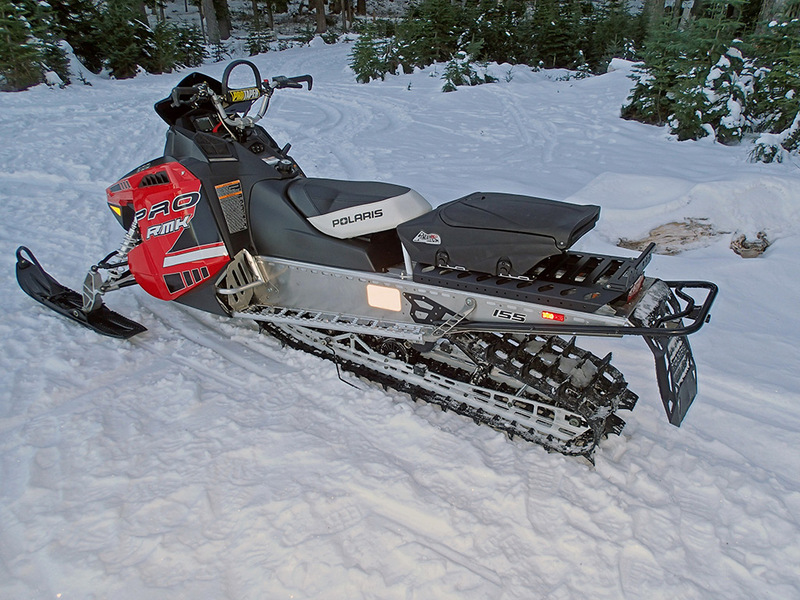 Up North Technologies also offers accessories for their snowmobile cargo racks, including: Cross and Side Rail Kits, LINQ™ Adapter Kits, and Fuel Caddy Kit (Ski-Doo only). Weight: 7 lbs 5 oz. Up North Technologies is an American company committed to designing, developing, and manufacturing powersports accessories in the U.S.A. 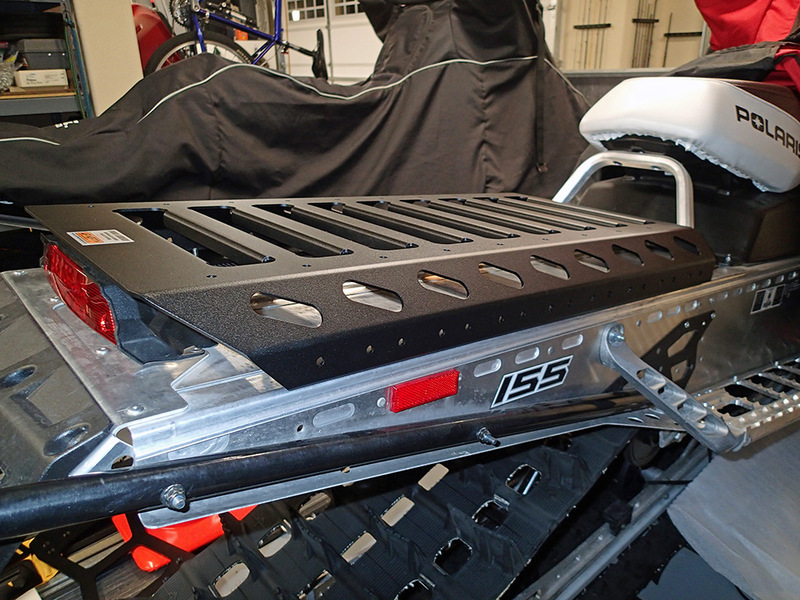 I am excited to have found their PRO SERIES snowmobile cargo rack system. There are numerous snowmobile cargo racks on the market, but none of them as well thought out and designed as the UP North Technologies PRO SERIES Modular Cargo Rack System. Until now, I had resorted to building my own snowmobile cargo rack out of 1/8" aluminum angle and bar stock. My rack is functional and better than other available racks, but nowhere near as light, sturdy, and good looking as the PRO Series rack. Besides function, I love how great the Up North Technologies PRO Series Modular Cargo Rack looks on my 2014 Polaris 800 PRO RMK snowmobile. The shape, lines, and cut outs are all well placed, making the cargo rack complement my snowmobile. The profile of the rack is perfect, allowing it to just clear the taillight yet not be too large as to cause problems maneuvering the sled in tricky mountain riding situations. The plethora of slots and pre-drilled holes should make adding accessories very simple. From adding fuel cans to tunnel bags, the possibilities are endless. Installation on my Polaris snowmobile was a breeze. The P-155-XL PRO SERIES snowmobile rack is designed specifically for my sled model, utilizing the Polaris T-slots already integrated into the tunnel. Six bolts, washers, and nuts are all that is required. The only improvement I can see is proving all stainless steel hardware (my kit came with stainless steel carriage bolts, but the nuts and washers were zinc plated steel). Like any snowmobile accessory, the PRO SERIES cargo rack is not meant to increase the weight carrying capacity on the tunnel. Even so, the PRO SERIES rack is designed in a way that should actually reinforce the tunnel (but you still shouldn't exceed the manufacturer's maximum weight rating for the tunnel). 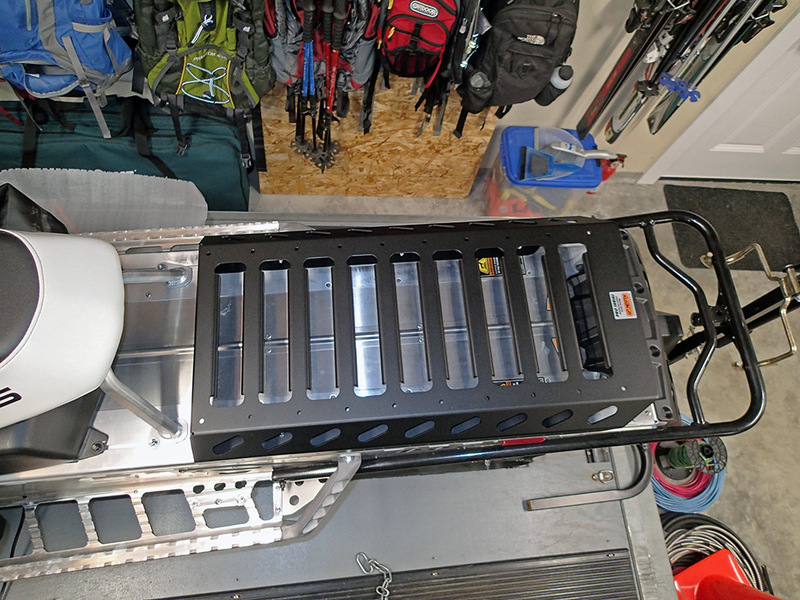 As I eagerly await enough snow to go riding, I'll have to settle for hanging out in the garage admiring the Up North Technologies PRO Series snowmobile cargo rack. I just wish I had found this fantastic product sooner. After finally getting enough snow to take the sleds out, I was happy to test the UP North Technologies PRO Series snowmobile cargo rack on my Polaris 800 Pro RMK. The first thing I realized is it looks even better in the snow! I installed a Powder Keg storage box on top of the PRO Series tunnel rack. It was easy to install and still leaves room on the back portion of the rack. I also added one of UP North Technologies' cross rail brackets (optional accessory for their tunnel racks) to the back of the rack. It gives me another attachment point and makes it look even better with the Powder Keg installed. And I can quickly take the Powder Keg off when I need the entire tunnel rack for something else. Even though there wasn't much snow and we were limited to trail riding only on this trip, the PRO Series snowmobile cargo rack performed flawlessly. It was never in my way and easily supported the weight of the Powder Keg loaded with food and drinks. I like the convenience it offered. I didn't have anything stored in the back portion of the rack and found it a great place to set my backpack and other items during breaks. I still firmly believe it is the best snowmobile tunnel rack on the market and look forward to using it all season. See Bennett Pass adventure where the Up North Technologies PRO Series snowmobile cargo rack was used. Special thanks to Up North Technologies, Inc. for providing the PRO SERIES Modular Cargo Rack System for review.